Winners of six of their past eight, Mariners go against 2012 NL Cy Young Award winner R.A. Dickey, who isn’t having the year Seattle starter Hisashi Iwakuma is. In 2008, when the Mariners were en route to 101 defeats, they employed struggling knuckleballer R.A. Dickey, who did little to add to the positive ledger of team lore. In 32 appearances, including 14 starts, Dickey posted a 5-8 record with a 5.21 ERA, and his season included one notorious highlight: on Aug. 17, he tied the major league record of four wild pitches in one inning, vs. Minnesota. The Mariners got rid of Dickey and he went on to pitch with little distinction for the Twins and Mets for three years before producing a career year in 2012: a 20-6 record, 2.73 ERA and a National League-high 232.2 innings. He led the league with 230 strikeouts and won the Cy Young Award. Dickey is the second pitcher to win a Cy Young award after leaving the Mariners. Randy Johnson won four after exiting Seattle. The 32-year-old Iwakuma, a Tokyo native in his second major league season, both with Seattle, will make his seventh start and first against the Blue Jays. The only trouble for Iwakuma, the major league leader in WHIP (0.69), this season has been a bothersome blister on his middle finger, now apparently on the mend. Iwakuma, who has fanned 19 batters in his past two starts, will be seeking his first victory since April 12. LAST START: April 28 at Safeco Field, took a no-decision in Seattle’s 2-1 win over the Angels; no earned runs on 3 hits in 6.0 innings; 8 strikeouts, 0 walks, 92 pitches, 66 for strikes. LAST VS. BLUE JAYS: July 30, 2012, won 4-1; 1 earned run on 4 hits in 8.0 innings; career-high 13 strikeouts, 3 walks1 home run, 109 pitches, 77 for strikes. CAREER VS. BLUE JAYS: 1-0, 5.00 ERA in 2 games, including 1 start, covering 9.0 innings; 15 strikeouts, 4 walks, 1 home run, 1.22 WHIP. AT ROGERS CENTER: 0-0, 36.00 ERA in one appearance covering 1.0 innings; 2 strikeouts, 1 walk, 1 home run, 4.00 WHIP. LOVES TO FACE: Brett Lawrie (0-for-5, .000), Colby Rasmus (0-for-5, .000), Edwin Encarnacion (1-for-5, .200). HATES TO FACE: Jose Bautista (1-for-1, 1.000), Rajai Davis (1-for-4, .250). CURRENT BLUE JAYS VS. SAUNDERS: 4-for-27, .148 BA, 11 strikeouts, 2 walks, 2 home runs, .207 on-base percentage. 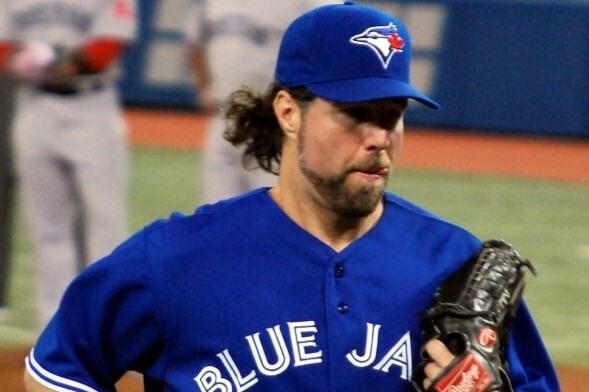 The 38-year-old Dickey, in his 11th major league season and first with Toronto, will make his seventh start and first against his old club, for whom he pitched in 2008. Dickey won the National League’s Cy Young award last year with the Mets, but is off to a tough start in Toronto. He lost his first two, won his next two and has dropped his last two, suffering one-run decisions in each. Last year, he went 20-6, 2.74 for the Mets. LAST START: April 28 at N.Y. Yankees, lost 3-2; 3 earned runs on 4 hits in 7.0 innings; 4 strikeouts, 1 walk, 2 home runs, 94 pitches, 59 for strikes. LAST VS. MARINERS: June 7, 2009, took a no-decision in Minnesota’s 4-2 loss; 0 earned runs on 2 hits in 2.0 innings of relief; 3 strikeouts, 1 walk, 0 home runs, 40 pitches, 30 for strikes. CAREER VS. MARINERS: 3-1, 4.43 ERA in 9 games, including 1 start, covering 22.1 innings; 15 strikeouts, 9 walks, 2 home runs, 1.34 WHIP. AT ROGERS CENTER: 3-4, 6.05 ERA in 8 games, including 6 starts, covering 38.2 innings; 31 strikeouts, 16 walks, 7 home runs, 1.57 WHIP. LOVES TO FACE: Endy Chavez (0-for-3, .000), Jason Bay (0-for-1, .000). HATES TO FACE: Raul Ibanez (10-for-28, .357), Michael Morse (7-for-27, .259), Kendrys Morales (1-for-4, .250). CURRENT MARINERS VS. DICKEY: 18-for-65, .277 BA, 7 strikeouts, 5 walks, 3 home runs, .329 on-base percentage. CURRENT ROAD TRIP: Three at Toronto, an off day Monday and two at Pittsburgh Tuesday and Wednesday. The Mariners return to Safeco Field Friday to begin a three-game series with the Oakland Athletics. The Mariners have won two in a row and five of their last six contests. Felix Hernandez has thrown six quality starts in seven outings. Friday, in beating the Blue Jays 4-0, he lowered his ERA from 1.90 to 1.60. In the Mariners’ 14 victories, they are batting .312 (35-for-112) with runners in scoring position. In 17 losses, the Mariners are batting .115 (13-for-113) with RISP. The Mariners have no hits with RISP nine times in 31 games.